You are currently browsing the tag archive for the ‘Mackey Park Figs’ tag. I read in the May newsletter of the Marrickville Heritage Society that local resident Michael Pearce passed away on 28th April 2010 after a long illness. I am quite sad about this. 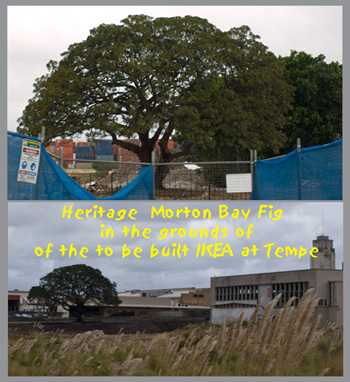 Michael was one of the residents who addressed Marrickville Councillors on 11th August 2009 in the campaign to save the 2 magnificent Hills Fig trees in Mackey Park Marrickville South. Michael was very supportive of the campaign to save these trees & kindly agreed to allow me to publish his speech to Council in SoT. This was very important to me as I desperately wanted these trees to be retained & SoT was only 2 months old at that stage. His support meant a lot to me & I was & still am enormously grateful. 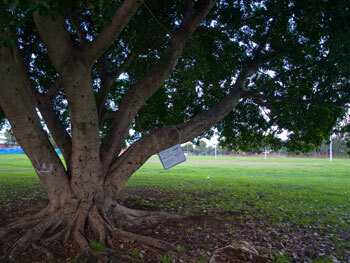 He did help save the Mackey Park Figs & I hope he felt good whenever he saw them when he visited or passed Mackey Park. He knew the history of the park well as he had been going there since he was a young man. It was a pleasure to know Michael. He was full of verve & integrity. My thoughts go to his family. 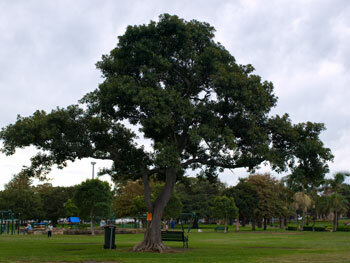 One of the Hills Figs in Mackey Park that the community fought successfully to save last year will be pruned by Marrickville Council some time after 27th April 2010. An Arborist has identified that one large branch is “unstable & susceptible to failure.” We knew this was the case last year, so have been expecting it. It should make more room for the light-pole Council wants to put to light the new soccer field. The branch itself is a big one, about a good-sized tree, so don’t be surprised if the tree on the right (if you are on the river-side of the trees) will look smaller & different. It is much better that the tree is pruned rather than losing it. 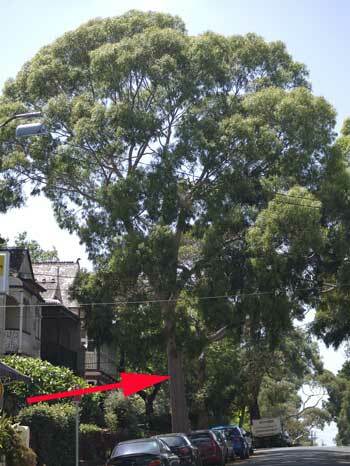 Thank you to Marrickville Council for notifying the community about this. 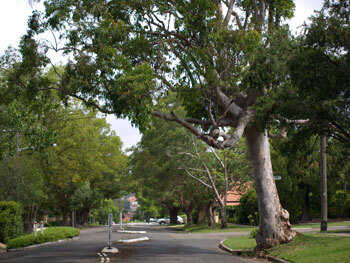 I was not aware that Council did notify the community about tree pruning. 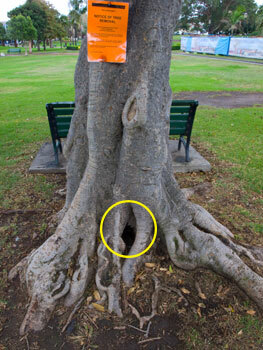 I think this is a good thing, especially when pruning will result in a significant change in the way a tree looks. I was also very happy to see that the notification sign had been carefully tied around the branch instead of using nails. Thank you for doing this as well. If you are feeling low or tired & would like to feel good for free, I would recommend that you take a walk & stand underneath these Fig trees at dusk. I guarantee you will feel an instant lift in your mood. These two Figs are veritable bird cities. The noise from chirping birds is fantastic & very, very loud. 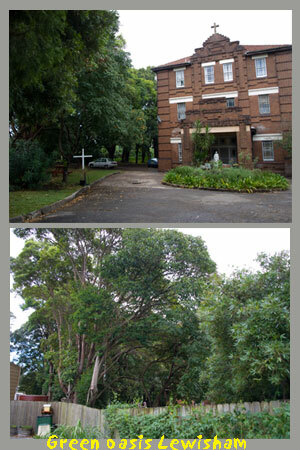 It is just as well the trees are located away from houses. You can hear the birds in these trees all the way to Carrington Road. It is interesting that none of the other trees from Carrington Road through Mackey Park to the Cooks River seem to have roosting birds. Maybe some are there, but they are very quiet. All the local birds seem to have moved into the 2 Hills Fig trees making saving these trees an even more wonderful thing. 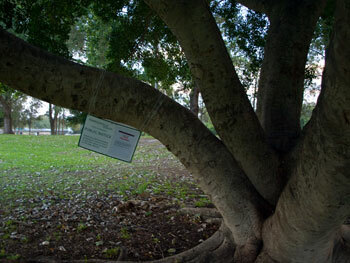 They are certainly very significant to the biodiversity in the area. 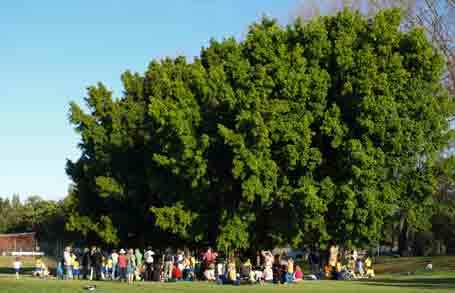 Something I read this morning which I thought was terrific: Friends of the Trees in Portland USA, a grass roots community group has planted 16,764 trees & shrubs over a 12 month period. Of these, 4,526 were large trees. 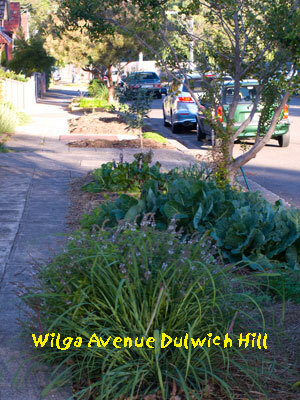 They were planted in parklands & on streets in neighbourhoods. Wouldn’t it be lovely if we had such a group in Marrickville LGA. 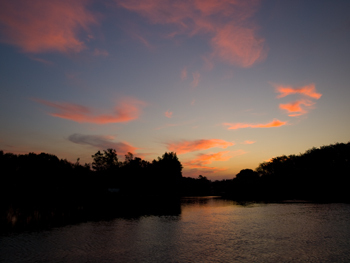 To finish off on a nice note, below is a photo of tonight’s sunset over the Cooks River.